This has been a huge week of developments for those closely watching the debate about the intersection of industry and the environment as related to wild rice in Northern Minnesota. Yesterday, March 25, Gov. Mark Dayton said in an interview that the Minnesota wild rice sulfate standard of 10 parts per million was "outdated," arguably too strict and punitive to struggling Iron Range mines. Probably not coincidentally, later that day the Minnesota Pollution Control Agency (MPCA) announced a sweeping new approach to how it plans to regulate the health of waters surrounding delicate wild rice plants, a staple of northern diets and sacred to native Ojibwa people in the region. Northern Minnesota's Iron Range region is home to several iron mines and nonferrous mining proposals, all of which produce the kind of run-off that can be damaging to fresh water and wild rice if not mitigated. Despite igniting some of the most heated politics Minnesota ever has experienced over an environmental rule, wild rice won a victory of sorts on Tuesday. But it will be a long time in coming. The Minnesota Pollution Control Agency revealed its proposed plan for protecting the state’s official grain from pollution that comes off the Iron Range and from about 200 industrial plants statewide. In an unusual approach, it calls for detailed scientific testing of the muck in each of the known 1,300 lakes, streams and wetlands that grow or have grown wild rice since the mid-1970s. The proposal itself will have to go through years of review. In the meantime it’s not clear whether the PCA will deploy existing environmental protections. State Rep. Tom Anzelc (DFL-Balsam Township) gave a statement after the MPCA announcement. Anzelc is chair of the Iron Range legislative delegation. (Full disclosure, he's a friend of mine and I help him with his campaigns). “I am optimistic because of Governor Dayton’s leadership. 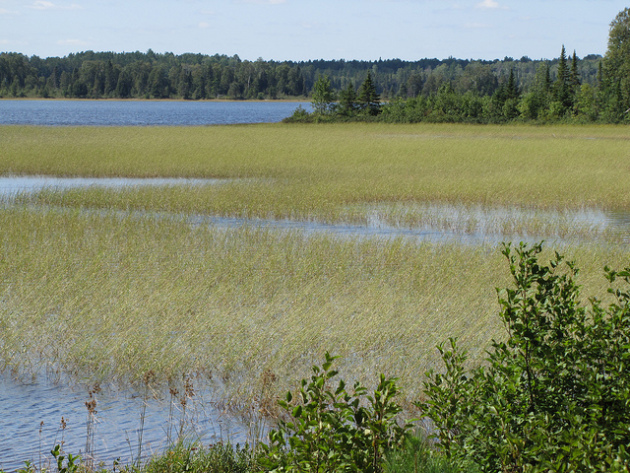 The commissioner outline a new rule-making process that will address sulfate, which is harmful to wild rice, and provides a path forward for taconite mines and municipal waste water treatment facilities. This rule will hopefully protect the economy in northeast Minnesota as well as clarify the environmental standards that protects our waters. This is a positive step forward for the Range and Minnesota. This is where environmentalists and the Ojibwa bands have a compelling argument that while this may sound like a working compromise to the wild rice issue, it risks becoming a de facto suspension of the wild rice sulfate rules for most waters in the state. The effectiveness of this new policy proposal would be determined in its execution. It remains to be seen whether this MPCA gambit will tamp down the nullification and deregulating bills that quickly cropped up in the State House this year. One thing is certain: the debate has shifted dramatically.